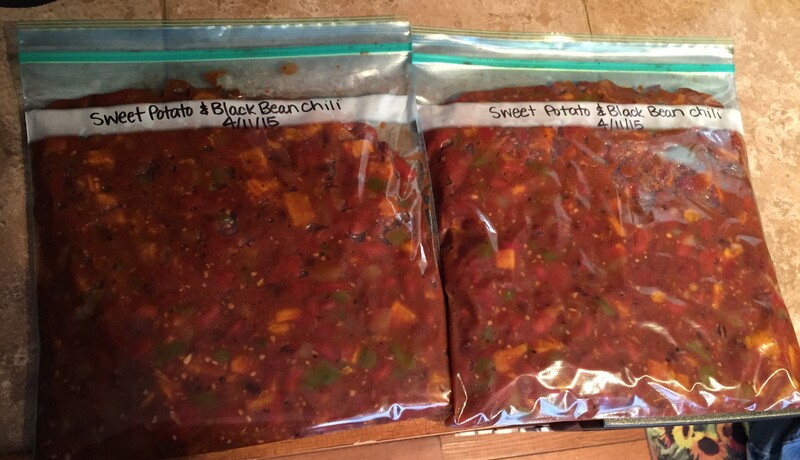 Before I had Kevin 2 and a half years ago, I spent a weekend making a few freezer meals for us to have after he was born. I made 4 meals and blogged about it here. That post remains one of my most viewed (out of over 500 posts!). This time around I knew I wanted to make freezer meals again, but I wanted to make it easier on myself by slowly working on them rather than making them all at once. I also wanted to make a LOT more- at least enough for us to eat for about a month. I made a list of recipes from some of my favorite websites and cookbooks, and then did some meal planning. I decided that over the course of a few weeks, I would make each meal in a double-sized portion- one for us to eat now and one to freeze. By doing it this way it was much easier since I was already buying and prepping the ingredients, and would cook them both at the same time. I was so excited about this plan and got started right away, and just finished last night with #15! With all of these freezer meals, I fully cooked them and then froze them, so that they just require a reheat before eating. Since these meals will feed us for 2 or more days (we love leftovers!) it should definitely last us a month after Kyler is born, which makes me very happy! Here are all the meals I made with links to most of them – unless they came from a cookbook that I purchased. In that case I won’t be able to share the recipe due to copyright issues. But the cookbooks are definitely worth purchasing – they are our favorites! Here we go! 1. Baked Pasta with Spinach & Ricotta. A simple and delicious twist on baked ziti. 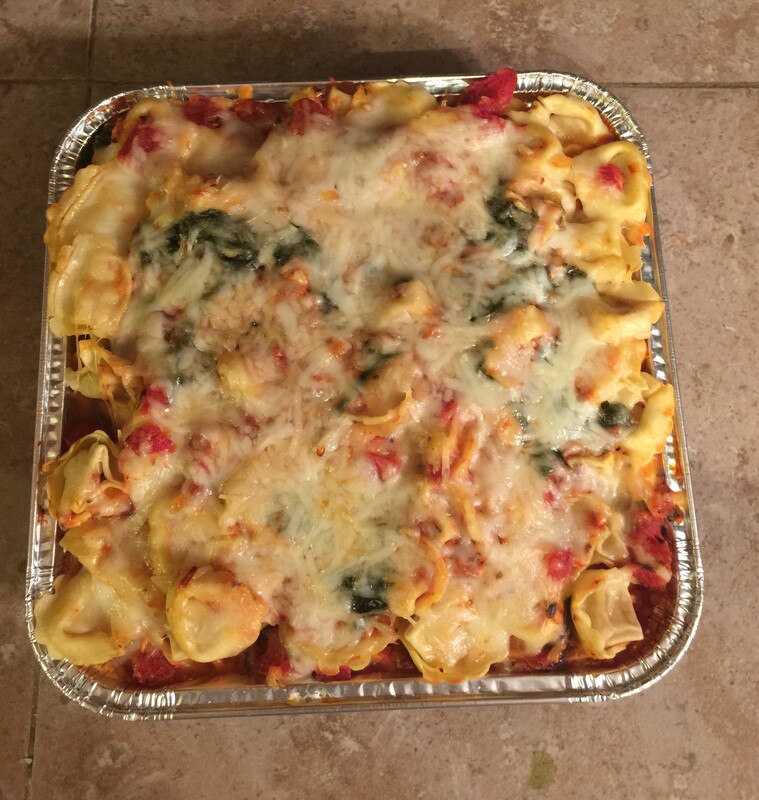 It consists of layers of mini pasta shells in marinara sauce, spinach and ricotta cheese, and mozzarella sauce. All 3 of us love this meal! 2. 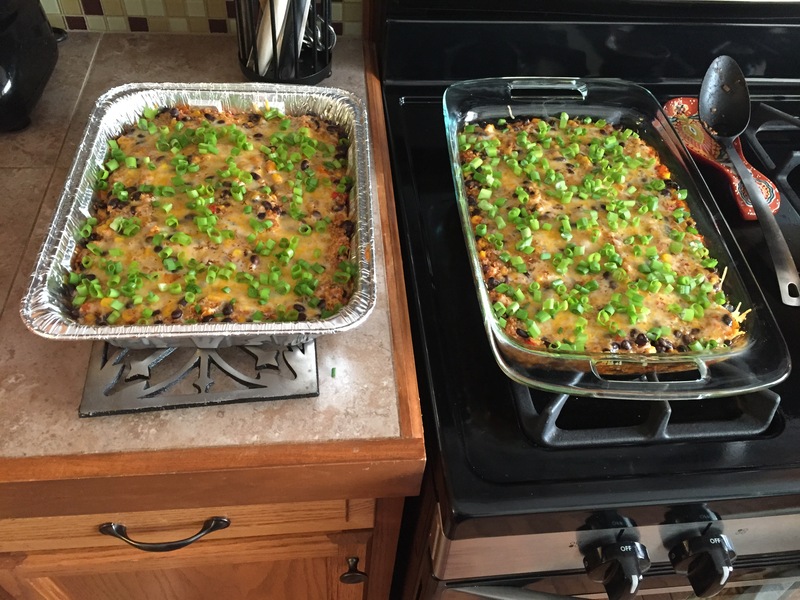 Black Bean Quinoa Enchilada Bake. 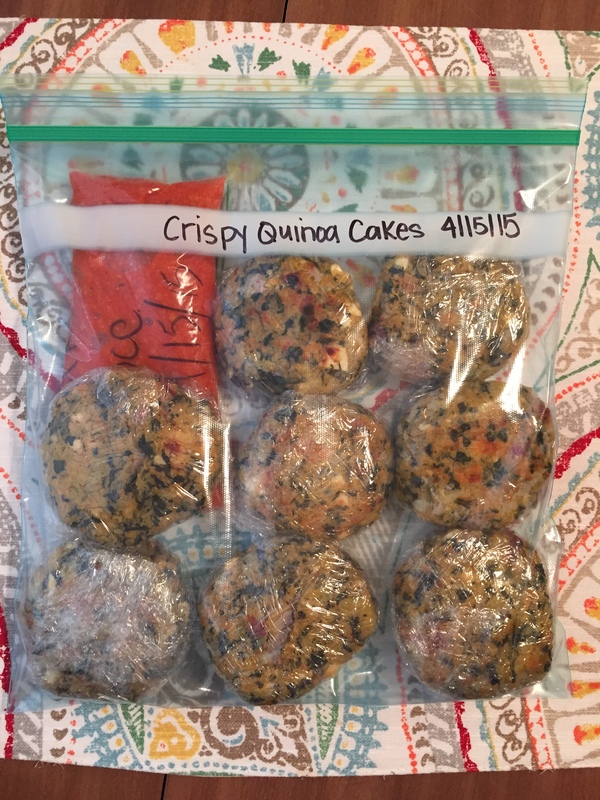 Another recipe from Two Peas and Their Pod, and this one is a favorite of ours! I make it frequently, and I made it for a friend after she had her baby a couple months ago. It is delicious by itself or with some tortilla chips for dipping. I can’t wait to eat this one after baby is here! 3. 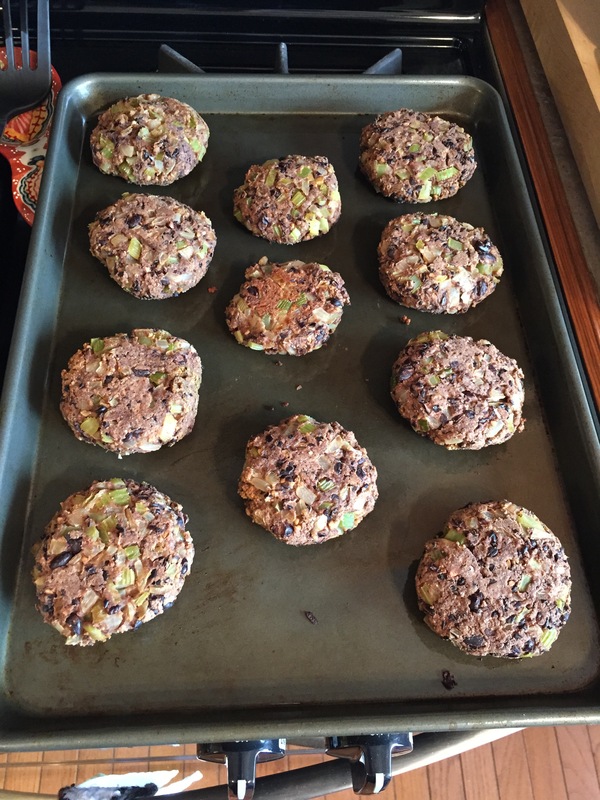 Black Bean Burgers. 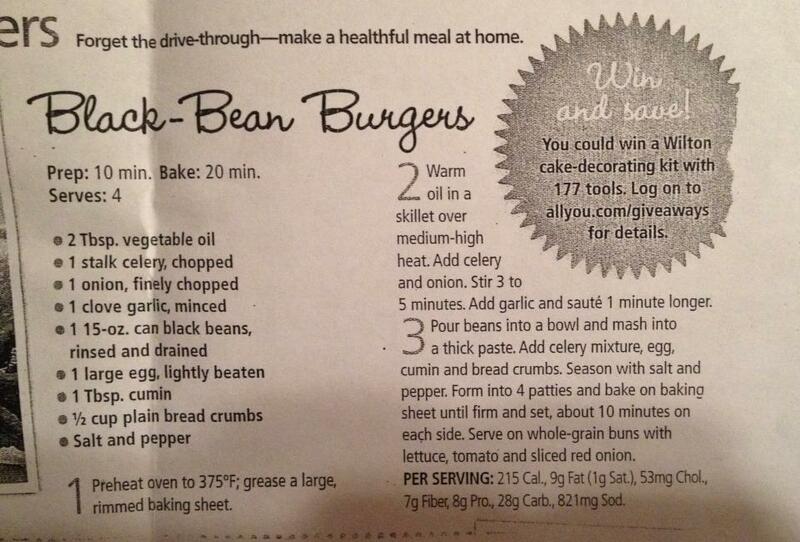 Someone randomly gave me this recipe and I’ve blogged about it before, but it’s so simple and delicious! 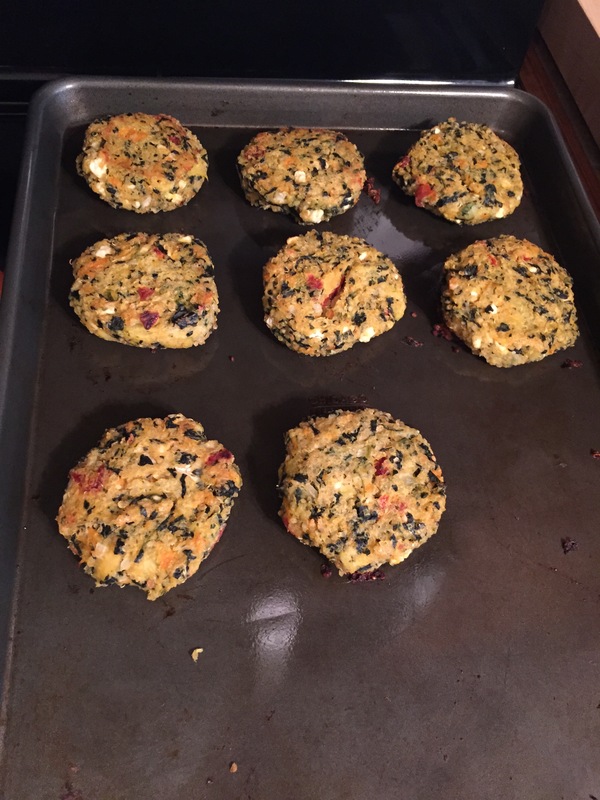 I thought that it would be nice to have some healthy homemade veggie burgers in the freezer for an easy and quick lunch or dinner. 4. Tortilla Soup. This recipe is from one of our favorite cookbooks, More Peas, Thank You, which was written by a former blogger named Sarah Matheny. It is so easy to make but has a ton of flavor. We love to top it with fresh avocado and baked tortilla strips. 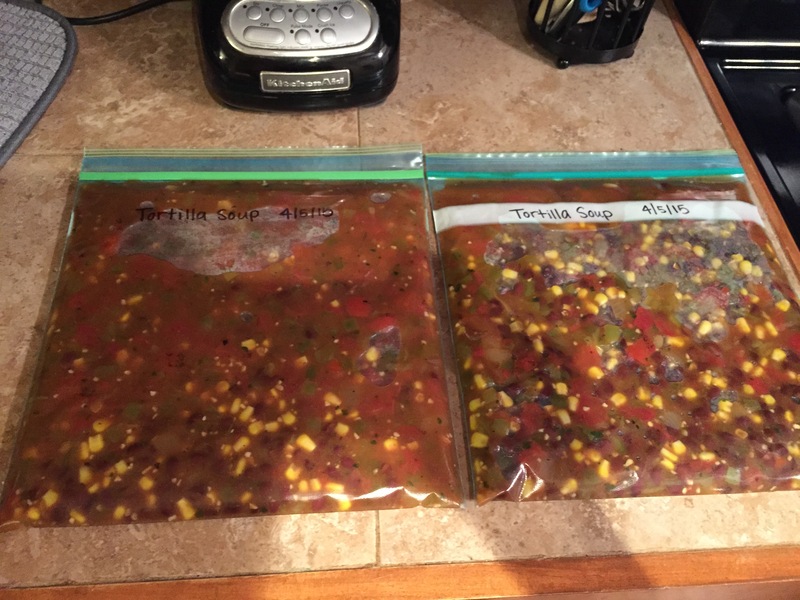 I made a double batch of this soup and put the extra in two large ziplock bags that I laid flat in the freezer to save space. I can’t wait to eat this soup on a chilly late-spring evening! 5. Vegetable Lasagna. Lasagna is pretty much the ultimate standard freezer meal. Some lasagna recipes are pretty complicated though, so I wanted to find one that was simple but packed with veggies at the same time. 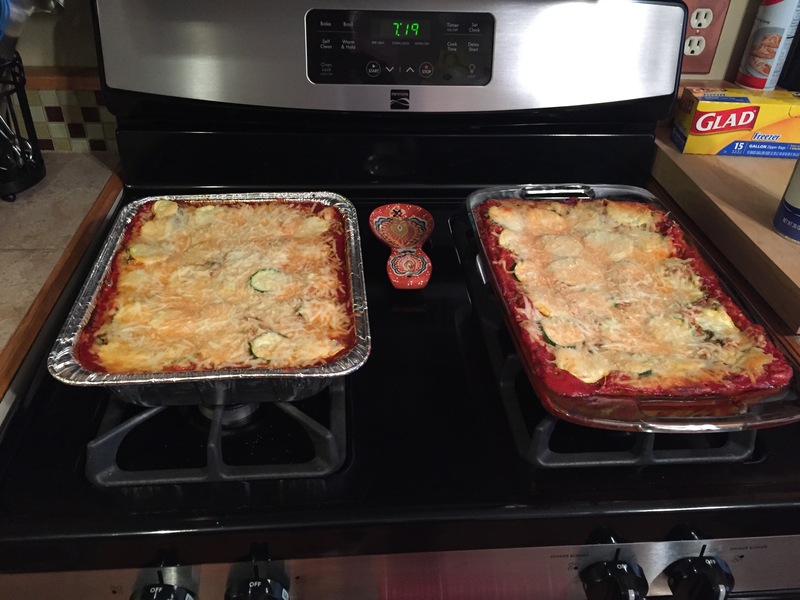 I used the recipe that I linked above, but I omitted the mushrooms and added more zucchini. I also didn’t cook the noodles before assembling the lasagna, and it turned out perfectly! 6. 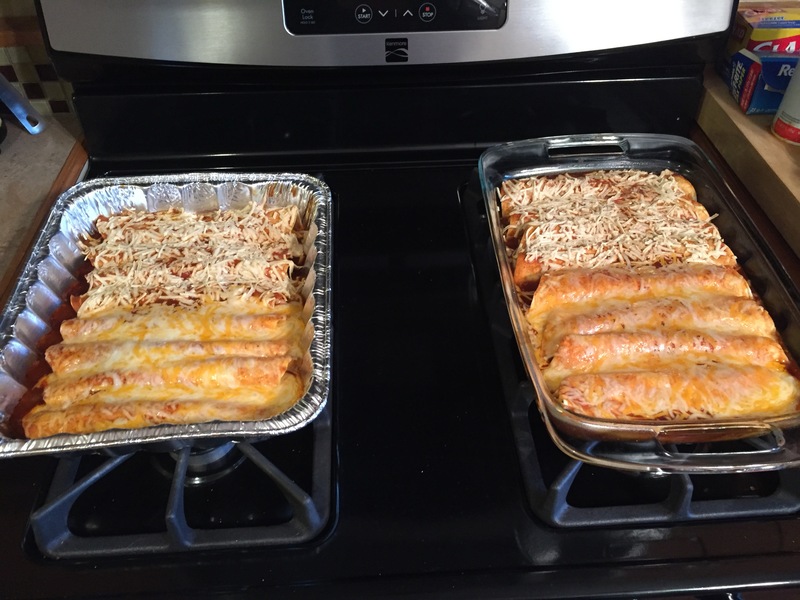 Red Lentil Enchiladas. This recipe is from Sarah Matheny’s original cookbook, Peas and Thank You, and is my hubby’s favorite meal. It was also one of the freezer meals we made last time! These are pretty much basic enchiladas that are filled with a mixture of red lentils, onion, jalapeño, cilantro and enchilada sauce. I topped half with real cheese and half with vegan Daiya cheese. I am slightly lactose intolerant but (obviously) still eat some cheese if you haven’t noticed in all of these freezer meals! I decided to use the vegan cheese for this meal just to give my body a break from the dairy. It still tastes awesome to me! 7. 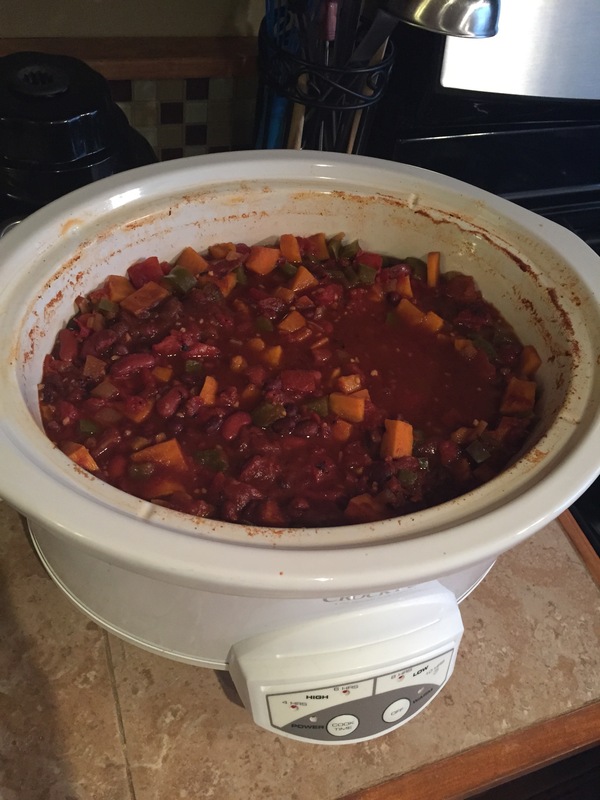 Slow Cooker Vegetarian Chili with Sweet Potatoes. I got this recipe from a friend after she made it for dinner one night when we came over. It is PACKED with flavor and so yummy with cornbread muffins or tortilla chips. Like the soup, I froze this in two large freezer bags by lying them flat. 8. Naan Pizza Pack. This was an idea I just made up. 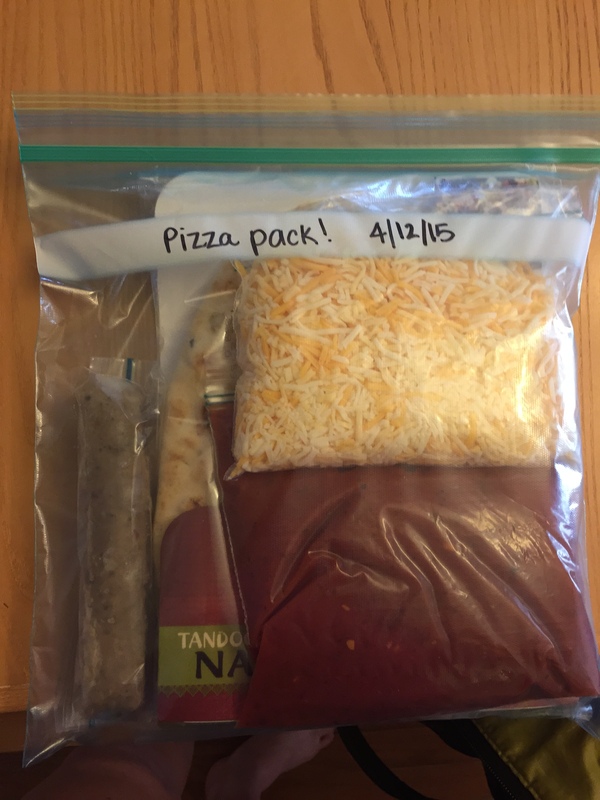 We love making pizzas with Indian naan bread, so I thought it would be fun to make a frozen ‘pizza pack’ with everything we needed to make simple pizzas for dinner one night. Inside a large freezer bag I put a pack of naan bread, baggies of marinara sauce and cheese, and a frozen vegetarian sausage that we usually split between the two of us. I figure whenever we want pizza after baby is here we can also throw any veggies we have on top as well. 9. 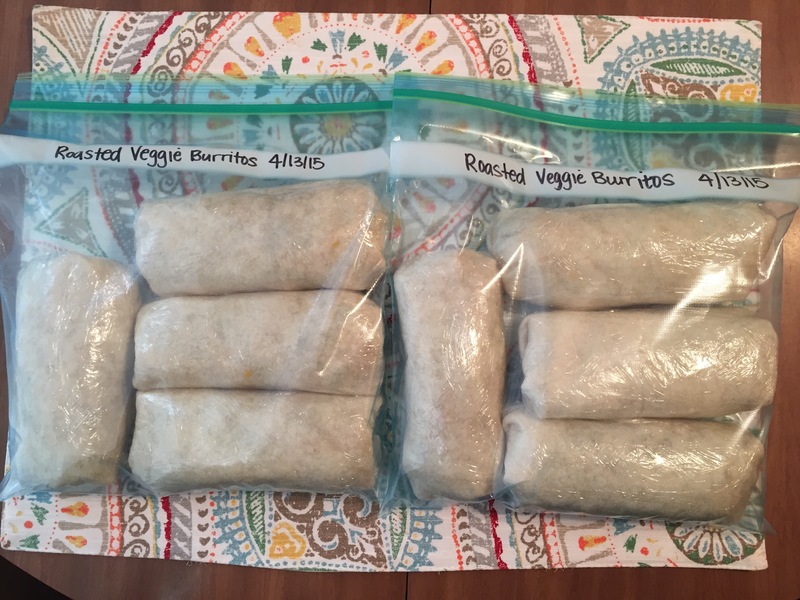 Roasted Vegetable Burritos. If you haven’t noticed we really like Mexican food! 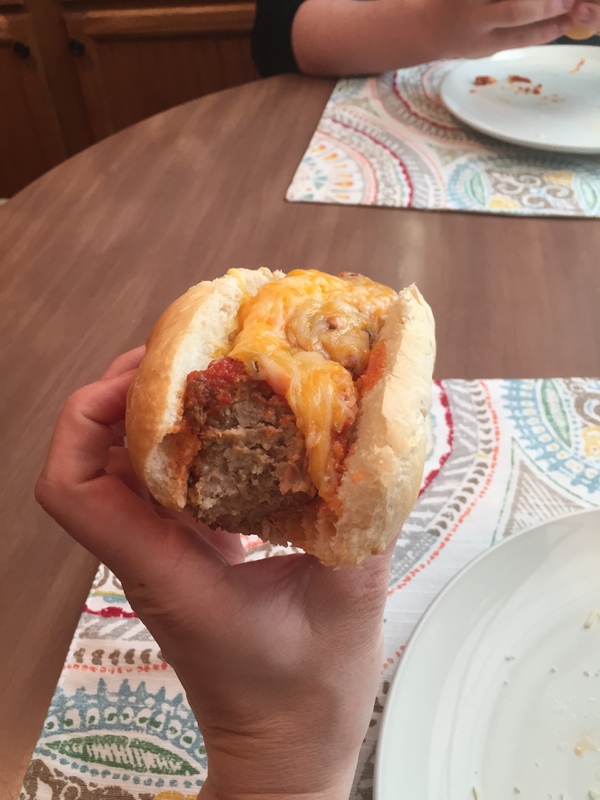 This recipe is from Budget Bytes, which is a website I discovered recently and love! Like the veggie burgers I made, I thought these burritos would be awesome to grab and eat for dinner or lunch. 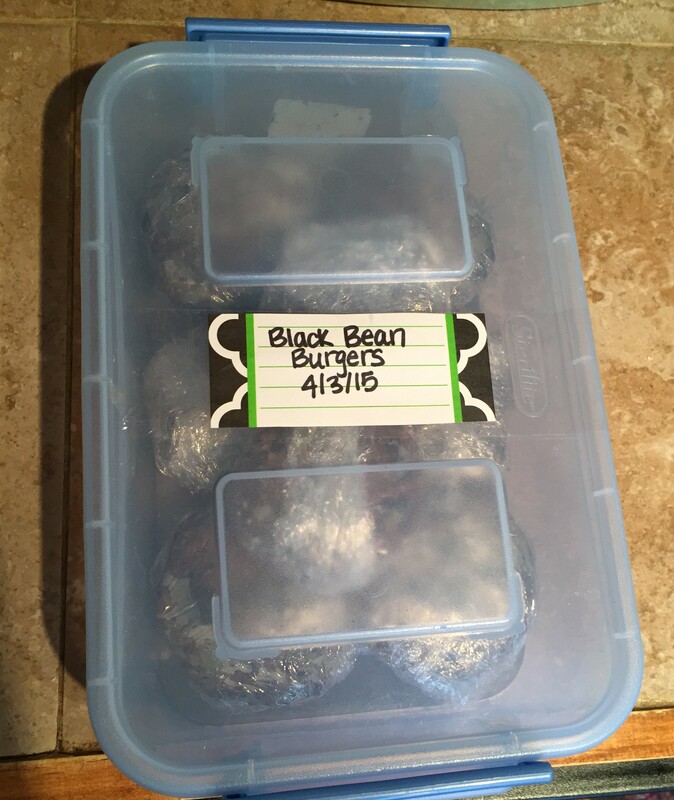 They are filled with Mexican rice, black beans, a little cheese, and roasted veggies. After having a couple for dinner, we were able to freeze 8 of them. I’m so excited to dig into these later! 10. 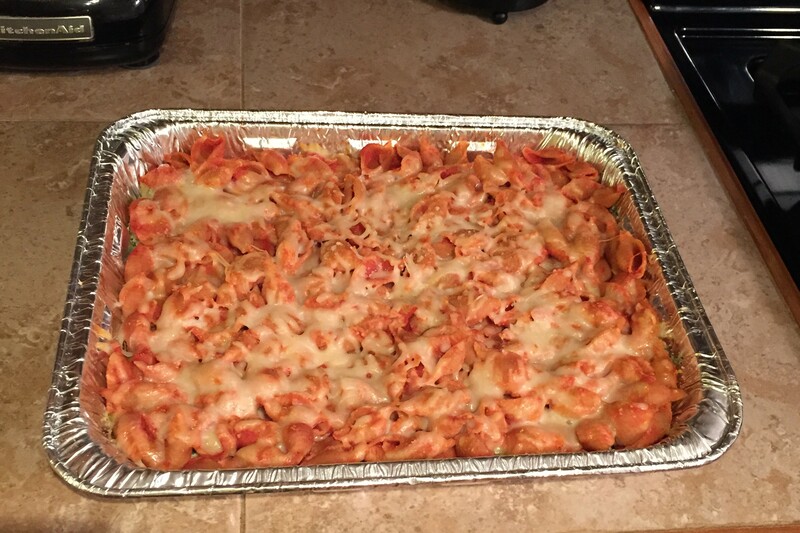 Easy Cheesy Baked Tortellini. This is another recipe from Two Peas and Their Pod. Both of my boys LOVE tortellini, so they were big fans of this meal. For this one I decided to just freeze half of it rather than make a double portion, which is why the pan is smaller. It’s still enough to feed the 3 of us though because it’s filling- a little tortellini goes a long way! My hubby actually made this one himself because I had a late doctor’s appointment on this night. He’s the best! 11. Crispy Quinoa Cakes with Roasted Red Pepper Sauce. We LOVE these little cakes from Vegetarian Times, but I do modify the recipe a bit. First, I skip the tahini (just not a huge fan of the flavor) and add an extra egg instead to help bind the cake together. I use baked/mashed sweet potato rather than grated, also for binding purposes. I also do not use the optional nuts. I love to eat these by themselves with the roasted red pepper sauce, or on top of a salad. 12. Stacked Roasted Vegetable Enchiladas. Yet another Two Peas and Their Pod recipe! 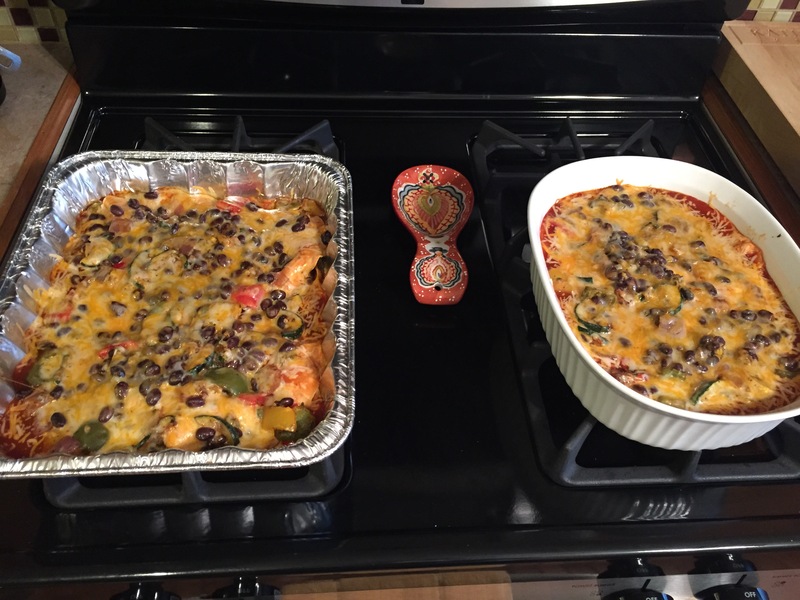 This dish consists of layers of enchilada sauce, tons of roasted veggies, black beans, corn tortillas, and cheese. It’s really delicious! 14. Pancakes. Who doesn’t love pancakes? We do! We love them for breakfast, but we also enjoy breakfast for dinner a couple times a month. Pancakes are super easy to make, but it’s also nice to have a frozen stash to pull from when time (or free hands) are limited. 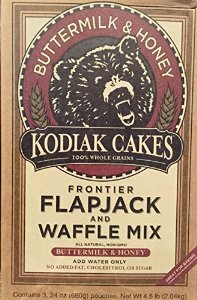 I kept it simple by using our favorite Kodiak Cake mix (just add water and they taste delicious!). 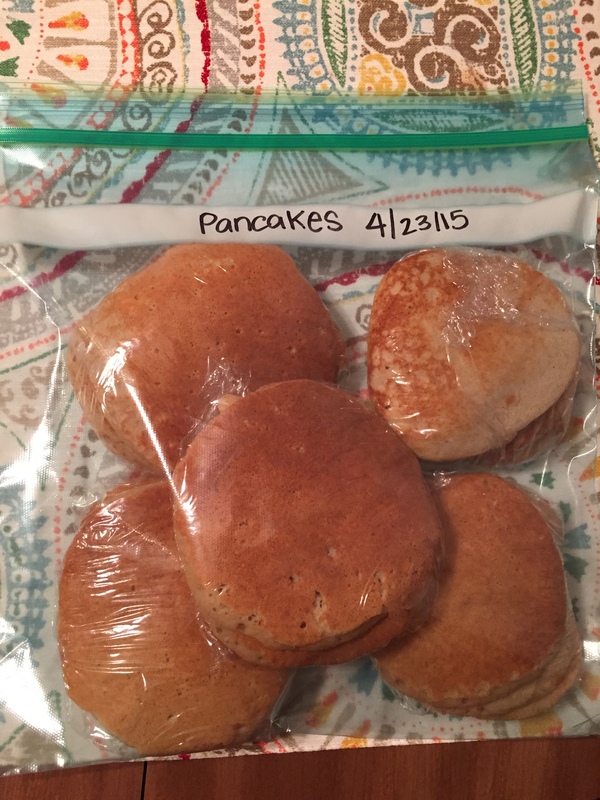 I wrapped up the pancakes in sets of 3 and then put them in a larger freezer bag. Yum! I am more than a little proud of my stocked freezer! I know I’ll be so thankful for these meals once baby is here and I can take a little break from cooking to enjoy some extra newborn snuggles 🙂 Please share your favorite freezer meals below- I am always looking to add more to my list! This entry was posted in Uncategorized and tagged Baby 2.0, Food. Bookmark the permalink. You’re welcome! I am excited to have all of these meals gathered in one post too, because I know I’ll refer back to it often! I hope your family enjoys these meals as much as we do! 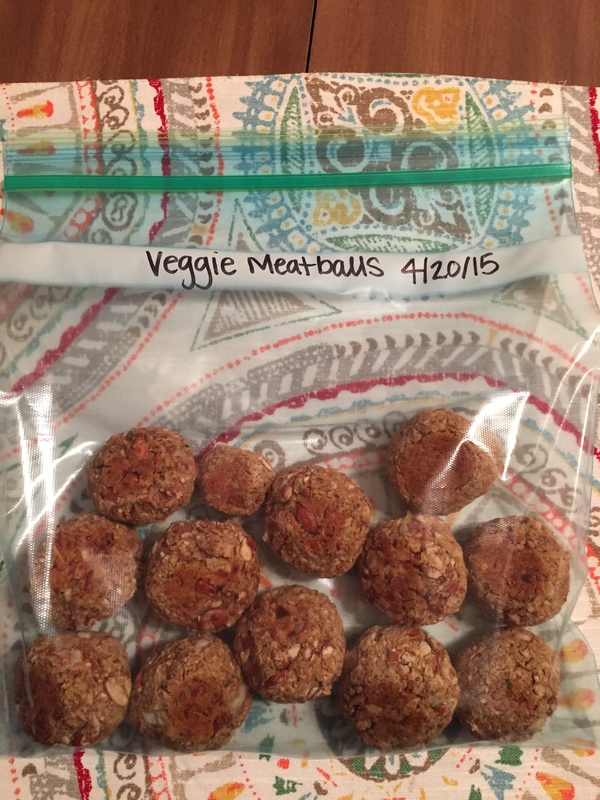 I first found your blog when I was pregnant and on Pinterest finding vegetarian freezer meals. I’m so glad you shared more! I’m definitely going to pin this post also in case there is another baby in my future. Thank you! I am preparing for my first baby due this May and I have to thank you x100! This is by far the best vegetarian freezer meal list I have seen!!! I can’t wait to start making these recipes.